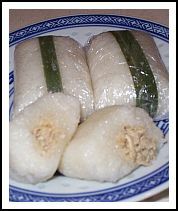 Sticky Rice Rolls or Lemper in Indonesian is one of the most popular Indonesian snacks. It's sticky rice filled with ground chicken. If you're very hungry, just take one, it filled your stomach and gives you much energy through the day and it's really a low calorie recipe. So it makes this snack very suitable to take away if you're planning to go somewhere. It's very practical snacks that you can consume anywhere and everywhere. And above of all, this is probably the easiest Indonesian desserts to make. It’s really simple and fast to make. Just follow the instructions and I’m sure you will be succeed to make this popular snacks, and don’t forget to make it with passion and love and the end results would never be disappointed if you add these” two ingredients” in it. Rub the chicken filet with white vinegar or lemon juice to release the fishy smell of chicken, then wash it with clean water. Cook the filet until tender. Take them out of pan. Chopped the chicken filet very fine. Set aside. Don’t throw away the chicken bouillon. Sieve the water clean with kitchen towel into the bowl. Set aside. Make spice paste of garlic, onion, lesser galangal and coriander. Heat 2 tabs sun oil in the pan and fry the spice paste and stir it until fragrant, add the chopped chicken filet, bouiilon water, galangal, kaffir lime leaves (squeezed it before you add them), salt, sugar and chicken bouillon powder. Stir it occasionally and let it cook until the water completely gone. The filling is ready to use. Wash the glutinous rice a few time until you got the clear water if you stir it with your hands. Drain and set aside. Cook the coconut milk, add 400 cc water and 1 tsp salt. If you have pandan leaves, add them too, but it’s not necessary, because pandan leaves is not easy to find if you live in Europe or USA. Let them cook until boiled. Set aside. Meanwhile preheat the steam pan, put the glutinous rice in and let them cook for 30 minutes. Take the glutinous rice out and add them into the coconut milk that you have already cooked, stir it until it's not much coconut milk left over. Let it cool down for 15 minutes in the pan. Heat the steam pan again, and put the rice back into the steam pan, and let them cook for about 45 minutes. Don’t forget to check of the steam pan have enough water underneath. After 45 minutes, taste a pulp of rice, you can proof it of the rice already well-done. Take them of the fire and begin to make the outside of lemper. Take a pulp of rice, put it into the plastic, squeeze it until you get a block of rice, and spread out the rice into square shape. Place a tablespoon of the filling in the middle of it and using the cling film lift the rice around the mixture.